A fundamental feature of Toyota’s management system (and its derivative, Lean management) is the search for the truth. Why? In order to make real improvement – versus merely the appearance of improvement – one must know what is actually happening. And herein lies a problem: People often do not want to know what is actually happening. Instead, they prefer a more comforting lower-resolution image of reality, one that omits the details that would inform them that things are not as good as they imagine them to be. When people high up in the hierarchy are satisfied with unrealistic images of reality, a phenomenon called “social learning” takes place, in which people at the bottom of the hierarchy learn that it is acceptable for them to also be satisfied with unrealistic images of reality. The result is that needed improvements go unrecognized and uncorrected, until such time the need for improvement becomes overwhelming. The long delays between when improvement is needed and when improvement is made leads to handicaps in the execution of business processes. You could think of a process as having a handicap of 32 if the first pass yield is only 68 percent. Unfortunately, classroom learning is no match for social learning. Even though most classroom learning in primary, secondary, and higher education is of a practical nature, the lessons learned are often not used in the workplace. This includes critical thinking, of which root cause analysis is one form. Social learning is also effective at displacing company-sponsored training. Everyone can cite examples of company-sponsored training that people up and down the hierarchy failed to put into practice on-the-job. Root cause analysis is a simple example of an educational or training experience that often fails to get put into practice. Executives do not perform root cause analysis for the types of problems they encounter because it conflicts with their image of reality; their view that, as a result of their effective leadership, everything is as it should be. Business results are good, so the processes must also be good. Even when business results are not good, the processes are still viewed as good, though the people who own the processes are seen as bad and need to be replaced. Lower-level employees learn from this, and they see that there is not much benefit in improving processes if leaders ultimately judge people to be the cause of process failures. Given these circumstances, it is not surprising that root cause analysis – or any other method of problem-solving whose intent is to get to the truth – is difficult to establish in organizations. Yet, there is usually a requirement for lower-level employees to conduct root cause analysis when processes go awry. They will go through the motions and produce a root cause analysis, the quality of which management is usually unable to judge because they have little practical experience doing (or producing high-quality) root cause analysis. So, root cause analysis becomes an exercise in assuring that the result is not too far from managers’ unrealistic image of reality. We also know that performing root cause analysis is acceptable for machine processes and for other value-adding processes that take place at lower-levels of the organization, but it is unacceptable for management or leadership processes. That is because any effort to expose the truth related to management or leadership processes upsets the status quo and their unrealistic images of reality. A radical is someone who gets to the root of things. As many lower-level employees have surely found out, doing a high-quality root cause analysis exposes the truth and makes managers and top leaders uncomfortable, and may result in being marginalized or even retribution. Facts do not live comfortably in organizations whose leaders prefer to believe in fictions. Nor do fact-based employees. 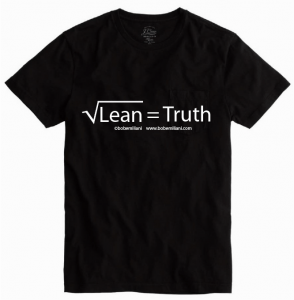 In following Toyota’s methods, Lean management seeks to expose the truth in a non-blaming and non-judgmental way so that all employees can improve continuously. This one problem-solving tool, root cause analysis, illustrates the major obstacle in transforming an organization from Classical management to Toyota-style (Lean) management. If leaders cannot acknowledge the simple truth about internal process failures, then you can be sure they are unwilling to acknowledge the truth about large or more significant problems. Lean management is not, and has never been, for the leaders who prefer fictions to facts (the truth). Had this been the litmus test decades ago, it is unlikely Lean would have achieved a large corporate following. Knowing this, efforts to promote Lean management could have been more focused and better directed to the smaller community of leaders who favor facts over fictions. Hi Bob, really enjoyed your article – goes to the bottom of why real root cause analysis fails in most organizations. Consultants have learned this and adapted: when they are hired by executives they stop somewhere in the middle of the whys and formulate solutions at this level. Obviously, the root causes do not get addressed… but the executive team is happy they have an action plan, and the consultant is happy as this (not getting to the root causes) is the guarantee for future work. Hi Ovi – Thank you. It is true that consultants (most, at least) have to work within the bounds of what is acceptable to their executive customer(s). Too often it is well below what can or should actually be achieved. Hi Bob, great article (as usual), it shows a common situation in most of the organizations. Management is relying on the actual processes, not interested if those are prone to easy generate defects or errors. When the root cause analysis happens, usually happens after a period of time so the true circumstances will not be known. The most common approach is to blame the ones doing the work and not to seek the truth. It goes to what you mentioned in the conclusion, there is a small pool of leaders that are interested in doing the right things, to be realistic and to get rid of the preconceptions – didn’t have the luck to meet them until now :). Thank you Adrian. Blaming people assures that truth remains hidden in the darkness. And blame has a large a social impact in that it distracts the organization from what is really happening. It is remarkably effective as an overt exercise of power in that it that keeps employees from wanting to seek the truth. Well put, sir! Might some root causes of rootless causal analysis lie in the socioeconomic forces that structure later stage – corporatist, global – capitalism? How might we test for them? Thank you Jeff. Yes, I believe I have illuminated that point in Triumph of Classical Management and other recent blog posts. But the more I dig into it, the more I find. So my work continues. How do we test for them? One way is observation, because tests are occurring all the time. I look for the self-tests performed by executives that confirm or refute their hypotheses. Hi Bob, loved the article! I was wondering what sort of incentives or business practices can be used in order to making sure your lower level employees are telling the truth consistently. What could you to in order to prevent them from lying for their own benefit as opposed to telling the truth for the company’s, so that these issues never arise in the first place. Hi Jacob – Lower-level employees will happily tell the truth when managers do not react in a negative way to the truth. The greater need for improved practices lies with the managers, not the lower-level employees. In other words, the onus is on management, not on the workers.